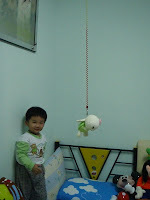 I love to play with Leng Chai(Handsome) every nite before my bedtime. Im enjoying very much pulling the string attached to it and let go. Leng Chai will jump up and down, swing left and right. And i will try to catch it. After the visit to the Paed , and applied on the antibiotic cream, my face now become more 'presentable' than the day before. Today , Mummy and Daddy came to fetch me from bbsitter's house. Mummy got a shock when she see me. My flu not getting any better but from bad to worst. I cried in pain everytime i wanna sneeze. Mummy pity seeing me like this. And she said tomorrow we will be going to the Paed. This morning Mummy received a sms from bbsitter saying that we're in the clinic. Mummy got a shock and quickly called bbsitter to ask about my condition. She told Mummy i was having minor flu but she dont know why my face was having all this red dot. And nite time, im having difficulty when sleeping time coz of nose blocked. I even vomit every time after my midnite feed. So as expected , after work, Mummy & Daddy straight came to see me. 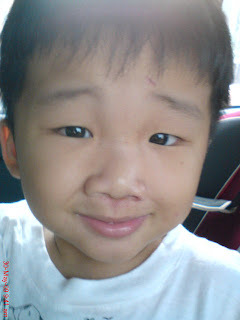 Mummy really heartache when seeing my face like this. It was due to my itchy hands. I keep on rubbing my nose and eyes. This was the 1st time i've encountered like this. Usually when i have flu, i will just have running nose but not like this. Mummy said after a few days, my skin will hardened and peel off too. After a 4D3N wait, finally Mummy and Daddy came back yesterday from their Bangkok trip. They must feel guilty for leaving me behind, so after they landed, go back have their shower, they direct come to fetch me from bbsitter's house. They must be worrying sick coz when they called back from Bangkok, i dont want to talk with them. I also know how to 'merajuk'. Mummy even tried to call in the morning , evening and nite to try her luck. But i insist dont want. So Mummy just managed to get the update about me through bbsitter. Like i said, i dont mind if they didnt bring me coz i know they sure bring back many pressies for me. From head to toes, from edibles to non edibles, from classic to modern toy.... everything got.. The first thing to greet me when Mummy step down from the car was this huge Goofy. Mummy knows im very fond with Disney characters since i came back from Disneyland, especially Goofy. Im so in love with Goofy , i even bring him to sleep with me , not allowing Mummy to touch. Then for my head, Mummy didnt buy hat or cap for me. But instead this.. 2 umbrellas, 1 with Tweety design and another one , my favourite character too, Pooh..
For my toes.... the new arrival of Crocs, the 1st ever kids sneaker( Mummy said she didnt see this model in Malaysia yet). I tried it on and i really loves it, it was very comfortable. Edibles , Mummy knows i love snacking, so she always brought back some for me.. This one very special, Enfagrow packet milk. Mummy said she didnt see it sell in Malaysia. I've tried it and dont like the taste coz im not an Enfa kid. Then for toys, Mummy bought this very classic toy made from wood..it was 4 chicks pecking on the rice board, but due to its fragility, i spoilt it after 1 minute play.. I love u, Mummy and Daddy.. Since Monday, Mummy and Daddy everyday came to visit me at bbsitter's house. They must be up to something. They even bring me to buy new toys every nite before going back. Hmm.. smell fishy..
Then today , they even bring me to Tesco, buy me toys and my favourite food. Back in the car, I heard Mummy whisper to Daddy whether need to tell me or not. Tell me what?? What?? I start to throw tantrum by punching Daddy's seat. Mummy said NO, but i still do. Thus makes Mummy angry and she beats me. Why beat me? I did nothing wrong and with an angry face i told mummy this - 'i dont friend you'. Before Mummy and Daddy left, they did tell me that they not going to fetch me this weekend. They asked me to be good boy and stay at bbsitter's house. They will go for a vacation, without me. Nah, im in good mood , so i just hug Mummy and said goodbye to her. Im so get used to it already, being dumped aside. Sound sad?? Not at all, coz i know when they're back, i will have many many new toys. Since i went to kindy, i can now talk in sentence instead of single word. But the way i put it in sentence still a guessing game to Mummy. Why ? coz i will omit some of the word. Usually when Mummy bring me back home, our next door neighbour seldom stay in. They treat it as their vacation house, came back once a while. So their house so quiet and dark. Everytime reach home, this conversation will start. Wyson : Mummy, see, so dark, no body..
Every week, the same conversation will repeat and repeat... but last week something different.. When we reach home, our neighbour home was lighted up and the wife was sweeping the floor outside. Mummy : Huh? Got body?? Mummy wonders if every kid will go through this. She remembers Chloe also have said the same thing, ' got body'. So , Aunty Hwei Li, can u please confirmed this? Yesterday, I was coughing terribly till i vomit a few times after having my milk. So Mummy decided to bring me over to the Paed. We've waited for more than 2 hours for our turn. After checking , the Paed said my lungs ok , and my throat just a little sore, so no antibiotic needed. Later at night, i start to have fever. My body was so warm and i keep on mumbling. Mummy feed me with medicine at 4:30am. The fever subside but comes back again after few hours. Me and Mummy dont have a good nite sleep while Daddy can doze off till morning. Im being cranky in the morning, so Mummy decided to send me back to bbsitter house. At least , Mummy can assured i get enough attention there. On the way , Daddy stop by at Shell station. So its my turn to take over the wheel. When reached there, Mummy sensed i've no appetite at all except drinking water. To be exact, i only preferred Ribena or 100-Plus. So , she cooked me this Teddy Bear pasta. I've only eat 2-3 spoon only, eventhough its really yummy. Today is Teacher's Day. Since this is my first year in kindy, Mummy suggest why dont we 'bribe' my teachers with some gift. Mummy think and think what she should get for my teachers. At first, she thought of getting this cup cakes for my teachers. But after she taste it, she dont quite like the butter cream taste. 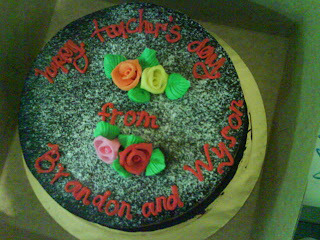 End up, Mummy bought this cake, shared with Yi-yi coz Brandon also going to the same kindy as me. To Mummy dissapointment, the cake turn out like this. So so so unpresentable and the decor also out dated. And the cake was from the famous Secret's Recipe. Mummy runs out of idea what to redeem from her credit card points and the points will be expiring soon. With not much points, and not much choice too, at last she redeemed this drawing board for me. At first was so excited getting this, just cant wait to start my drawing and coloring. Today is Mummy's Day. And also Eason gor gor birthday. So yi yi suggested we throw a small party for him at Pizza Hut. The place was so packed with people and the air conditioning not functioning properly. Everybody was so hot & sweating while dining here. We quickly finish up our meal and Eason gor gor even get a birthday pizza. Me first time seeing this and i dont like the taste also. But all the gor gor said it was very nice indeed. After Pizza Hut, we proceed to Baskin's Robbins to have the 'cake cutting ceremony'. The air-cond was cooling enough to make everybody mood flares up. Im so excited seeing all the ice cream cake display there. Till the extend i climbed up the counter to have a better look of it. Am so excited seeing cake everytime. Later at night, we all went to have dinner at one of the restaurant in Serdang. Place also full with diners. Eventhough Mummy have booked a table and dishes, we still wait for more than an hour for our dinner to be served. Mummy was very dissapointed with their service and said will never ever come to this restaurant again. Mummy heartache when seeing me having plain rice only due to the long waiting time and i still can said YUMMY. Mummy feels kind of regretted getting me this. But in the other hand, she said this more worth-buying than the spiderman balloon. That balloon didnt even last for 24 hours, and RM7 gone with the wind. This mouse only cost Mummy RM8. Today was so surprised seeing Mummy came to fetch me from kindy. I thought when schooling day, she also must be working. Argh, dont care what the reason was, as long as Mummy was here is good enough. Once step in the car, I told Mummy i wanna buy egg tarts. So to the bakery we went. Mummy even bought a small cake too. When we reach the saloon, I changed my mind. I dont want to go in. I dont want to cut my hair. Then Mummy said she will have her haircut first, followed by me later. Seeing Mummy so relax sitting there letting aunty cut her hair, i feel a bit relief. Next was my turn. I sit quietly on the high chair and let aunty cut my hair. Its not pain after all. Mummy feels so surprised i didnt throw any tantrum this time. She was very wrong. The moment Daddy wanna paid the bill, I keep pushing Daddy to the chair. ' Daddy, its your turn to cut hair. Sit down , sit down. ' When Daddy insisted he dont want, i was shouting hysterically at him. ' You must, you must cut hair. You must!!!'. Everybody in the saloon was laughing at me. They was saying i was such a cute little boy....hmmm, i just want my Daddy to have his hair cut, whats wrong with that??? Lately, im so into this game , water bomb. I will asked Mummy to do for me and put into this basin. Am having so much fun, but Mummy was complaining her fingers in pain coz tying up the balloons for me..